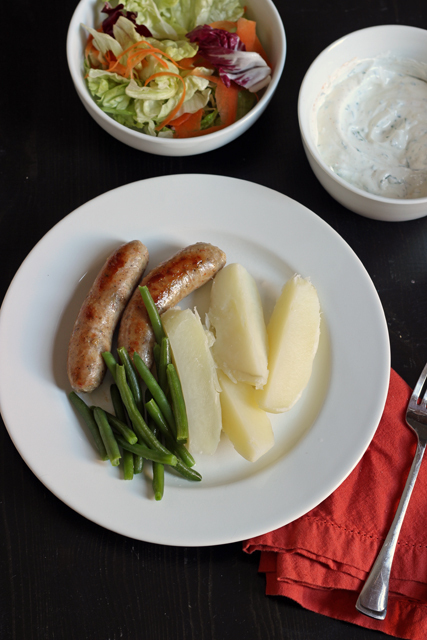 Make a quick fix dinner of sausages and potatoes topped with an herbed sour cream sauce. 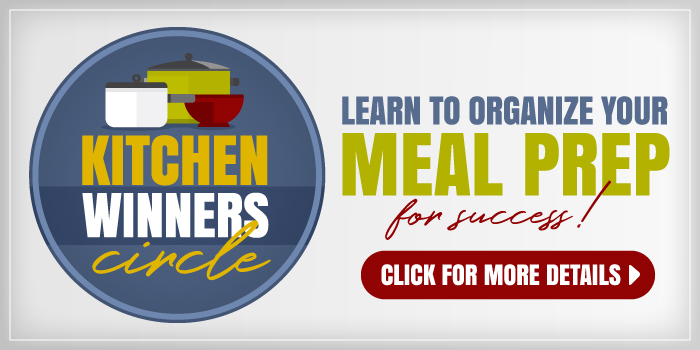 The recipe is super versatile, allowing you to mix up the herbs with what you have on hand. Our month in France was pretty fabulous. I finally finished posting the story of our European vacation, and I’m dying to go back. We had some great adventures as a family — and ate some fabulous meals. 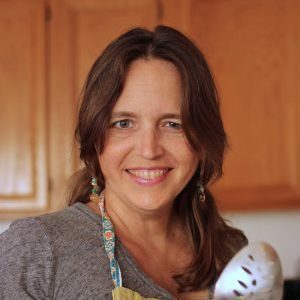 Since we had access to a kitchen for almost all our time in France, I got to go shopping frequently in french grocery stores and figure out how to make food I knew my kids would eat. While they did expand their horizons, there were requests for burritos and burgers from time to time. One of the items most frequently in my grocery basket were chipolatas. Similar to an Italian sausage in flavor yet the shape of breakfast links, we enjoyed these sausages often in Collioure and in Paris, usually with boiled potatoes and a salad. When we had lunch with the Benoits, Jen prepared a beautiful feast for us with grilled chicken, sausage, and potatoes. She added this delicious sauce on the side. I’ve been quizzing her from afar so that I could add it to my own repertoire. Jen makes it with fromage blanc, something similar to our sour cream. This supper is super simple, but so delicious! It comes together quickly in less than 30 minutes. If you can find new potatoes, use those so you don’t have to peel them. Mine have been growing eyes faster than I can use them, so I’ve been peeling. 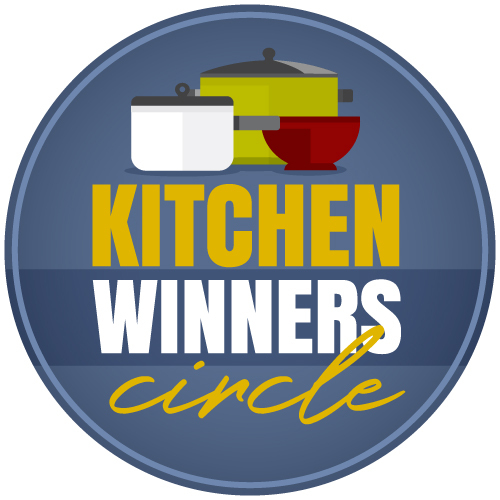 Keep an eye open for sausages on sale and stock the freezer when you find a good price. 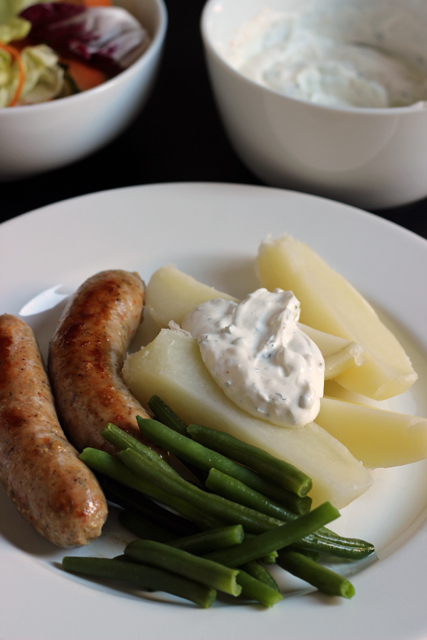 Make a quick fix dinner of sausages and potatoes topped with an herbed sour cream sauce. The recipe is super versatile, allowing you to mix up the herbs. In a pot of salted, boiling water, cook the potatoes until tender, about 20 minutes. In a nonstick skillet, add the sausages and enough water to mostly cover. Cook until the sausages are cooked through and the water has started to evaporate. Continue cooking the sausages until they’ve browned lightly. Meanwhile, stir together the sour cream, herbs, onion. Season to taste with salt, pepper, and pinch cayenne. Serve the potatoes and sausages with the sour cream sauce on the side. I love this! Such a practical family meal that no one objects to ! I’m quoting you. Yes, that’s exactly it! Such a simple yet filling meal. We have taken to eating turkey sausage and there is such a variety including one called Sweet Italian sausage which tastes really good. I’m going shopping in the next day or two and I’m going to pick up some sausage; I already have a lot of potatoes in the fridge and I’m going to make this. Fun! So glad to hear that the fajita bar was a hit. Yummy!